the life changes you desire. 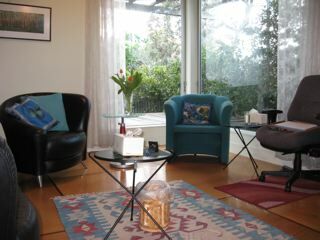 I provide face-to-face counselling for individuals, couples, families, children and young people, in my Auckland practice. What do people see me for? People seek counselling for a huge variety of initial concerns. For couples, wanting ways to deal more constructively with conflict and to learn better ways of communicating is a common hope and request. Couples also seek outside guidance to repair and recover from betrayal, such as affairs, or with changes in intimacy that so often occur amid the hectic demands of work and family life. I also work with parents (and sometimes other family members) to review different parenting styles, or concerns parents may hold about a childs' particular behaviour at home or at school. The Relational Narrative Orientation I use focuses not only on the presenting problems but also on the often hidden, neglected and new pathways where solutions can be found and problems solved. People describe my approach as creative, empathic and resource focused in ways that uncover unique solutions for each person or family's situation. Once we understand the concerns, we will identify resources that will support change. Although there is no "average", I often meet with people fortnightly and for between 3 - 8 sessions. The meeting or session hourly rate is $160 (plus GST). In most instances the session fee includes reflections or audio-recordings and 30minutes, where I am either preparing for our meeting or reflecting after the session. I believe reflections and or audio-recordings support people to act on the discoveries we make in sessions thereby increasing effectiveness and reducing the number of times we meet. Please alert me to any financial restraints once the therapeutic work goes beyond 6 sessions. I have a commitment to twenty percent of my work being either, no fee or a negotiated reduced fee. These slots are often filled quickly.